Plant a tree to remember or honor that special someone. The Midwest Club lost 33 trees in the common area due to the summer storms. Help us replace the lost trees with a $500 donation. The Midwest Club will purchase and plant your tree and place a plaque displaying your name and sentiment. Welcome to The Midwest Club! Prior to development, every square foot of The Midwest Club land was studied. Trees, shrubs, lakes and ponds, and elevations were painstakingly recorded on master plans. Provisions were made for the preservation of literally every important natural vista. Trees, some over 100 years old, were left undisturbed and others were precisely planted in select locations. Some hillocks and slopes were accentuated for better view or drainage. The seven waterscapes were substantially expanded, and over 40 acres were dedicated as "open space", forever protected in trust for the use and enjoyment of the Resident Members. At The Midwest Club, there are more greenbelt and waterscape areas than on any other land available in Oak Brook. The homes within the private grounds of The Midwest Club are custom built in a wide variety of elegant architectural styling. Architectural and landscaping controls have been established to assure quality in all of The Midwest Club homes. The common and community areas are managed by a professional on-site property manager. The cost of managing and operating these areas are borne by all of the residences in equal shares through The Midwest Club Homeowners Association, which is managed by a seven-member Board of Directors, all of whom are Midwest Club residents. 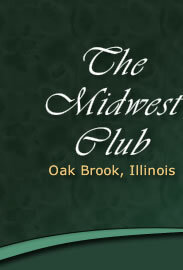 The Midwest Club's Clubhouse houses a formal Ballroom, which is available for rental by Midwest Club Residents only. The Clubhouse also has an informal Community Room and Snack Bar, which is open during the summer months. The adjacent Recreation Center boasts a guarded swimming pool with diving board and slide, a "Kiddie" pool, a large patio area and four tennis courts.